That pesky pigeon is back. 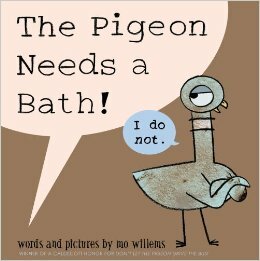 Here’s all the details on Mo Willems newest children’s book (about that pesky pigeon who wanted to drive the bus.) 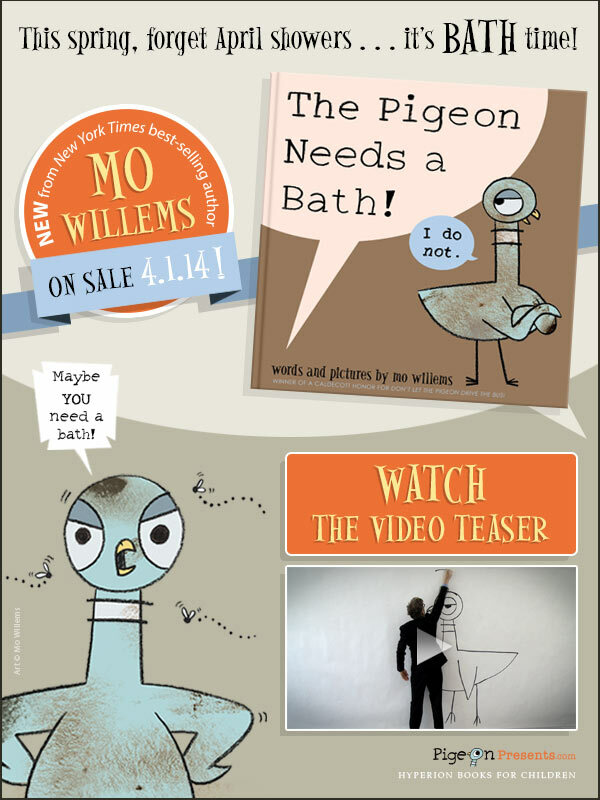 His next pigeon book will be released in just a few months — on April 1st of 2014 — but you can pre-order it now on Amazon. Yes, it’s being released on April Fool’s Day, and sure enough, it looks like the pigeon is up to some more tricks… The book is titled The Pigeon Needs a Bath, but on its front cover, the pigeon delivers a message of its own! Uh-oh, I see where this is going… Mo Willems first warned us (back in 2003), “Don’t Let the Pigeon Drive the Bus” (though the bird spent the entire book trying to convince readers otherwise…) But the pigeon’s adventures continued later the next year, in The Pigeon Finds a Hot Dog! ), and two years later readers were warned, Don’t Let the Pigeon Stay Up Late! They’re all delightful and funny stories where the pigeon just keeps on cajoling his readers, begging to be allowed to do something that a pigeon probably shouldn’t be allowed to do! Although in at least one story it’s the pigeon who’s being bothered, by a pesky little duckling! Those birds are always after something. (In 2012 published The Duckling Gets a Cookie!, and in 2008, Willems wrote The Pigeon Wants a Puppy!). In fact, when you buy a boxed set of the first three books, they come in their own cardboard bus! 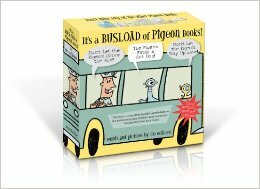 “It’s a Busload of Pigeon Books!” reads the title on the box — and the books come in adorable 6-inch edition (rather than the 9-inch versions you’d find at your local library). I’m a big fan of the pigeon books, so it’s exciting that there’s a new one coming soon. And it looks like I’m not the only one. Here’s the promotional image that was just sent out through Publisher’s Weekly‘s mailing list. It looks like everyone’s getting ready for some more fun with the pigeon this April!